Whether they're known as cougars, pumas, mountain lions or panthers, these mysterious mountain creatures have been part of myth and legend for thousands of years, inspiring kids and adults alike, and are a popular zoo and national park attraction, as everyone hopes to see them. 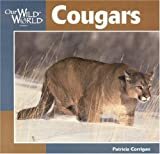 So read on to learn all about cougars for kids, with all sorts of interesting facts that adults will probably enjoy too! 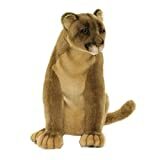 Cougar, Puma, Panther, or Mountain Lion? What on earth do we call them? So, what is it supposed to be called? Is it a puma, a cougar, a mountain lion, or a panther? And which one is correct? Well, that's the first interesting fact about cougars. They hold the Guinness World Record for the most number of names of any animal in the world! Since they extend so far throughout North and South America, they have plenty of names in plenty of different languages, and people call them different names even in the same country, so it depends where you are. There's no real "correct" name, but since the word "panther" often refers to the scientific group panthera (which refers to lions, tigers, leopards and jaguars), and the name "puma" can refer to a couple other animals (like the jaguarundi), and "mountain lion" has the word "lion" in it, we're going to call it a cougar, because there's no other cat called a cougar. But feel free to call it whatever you want! The cougar is the 4th largest cat in the world, behind the lion, tiger, and jaguar. But despite its size, it's not considered one of the "big cats," since it can't roar. 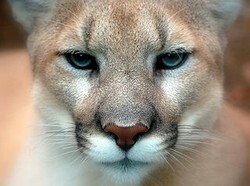 In fact, a cougar is actually more closely related to a common house cat than a lion or a tiger! But even though it's not considered one of the "big cats," it can still get pretty big. A cougar's body can grow to about 3 to 6 feet (1 to 1.5 meters), and can weigh anywhere from 65 to 220 pounds (about 30 to 100 kg), most often about the weight of an adult human. They grow larger in colder areas, where the extra bulk helps them stay warm, while staying smaller in hotter environments. They also stay smaller where their territory overlaps with jaguars, since the jaguar eats most of the larger animals, and the cougar goes after the smaller prey. Cougars are great jumpers, with powerful hind legs that help them jump up to 18 feet high (5.4m), and 20 to 40 feet horizontally (6 to 12m). They're also great climbers, and can even swim if they need to. Cougars have one of the biggest ranges of any wild cat, found all the way from Canada down to the southern parts of South America, living in a wide variety of habitats throughout this range. Cougars can be found living in mountains, deserts, forests, jungles, in high or low elevations, in hot or cold climates, meaning they're highly adaptable to many different environments, which is why they can be found in so many countries. A cougar's favorite type of environment is the kind it can use to hide, so it's most often found in dense forests or rocky areas, where it can use the landscape to hide in the bushes or behind the rocks while it's stalking prey. Like any wild cat, cougars are excellent hunters, and can be very good at staying hidden, making them difficult to spot in the wild. Like other cats, a cougar is a carnivore, and will hunt and eat whatever it can get its paws on. In North America, a cougar mostly goes after deer, elk, moose, or sheep, but can also hunt smaller animals like rodents, rabbits, insects, or birds. In South America, it goes after large rodents like the capybara, or other small or medium sized prey, since it is often living alongside the jaguar, which is a more powerful hunter and usually snatches up a lot of the larger prey. Cougars are most often active in the morning or the evening, when it's not too hot, but still nicely lit. Like most cats, cougars like to creep up to their prey as close as they can before they pounce on them, knocking them over and biting the neck to finish it off. This is why they prefer dense forests or rocky areas where they can hide most effectively. After a successful hunt, a cougar will drag its meal away somewhere safe, where it can feed without worrying about the meal being stolen by a larger animal, like a bear. If it's a particularly large meal, a cougar will cover the body with leaves and twigs, and save it for later. While cougars are powerful hunters, they often face competition from other wild animals, such as bears or packs of wolves, which are often strong enough to overpower a cougar and steal the prey. While a cougar can fight off a single wolf, it's not easy to fight a whole pack at once, and wolf packs can displace cougars and push them out of their territory by competing for food. Baby cougars are born blind, and stay hidden in the den for a few months, while its mother raises them and does all the hunting. Cougar cubs can start hunting at about 6 months, but stay with their mom for about 2 years before they go off on their own, find their own territory, and live alone, like most cats. Strangely, cougar cubs actually have spots, kind of like a leopard. This helps them blend into the environment and hide behind bushes or grass. The spots last for about two and a half years, after which they'll have the grayish orange fur coat like other adults. Life can be tough for a cougar, with the average lifespan between 8 and 13 years in the wild, which is part of the reason the mothers defend their cubs from harm so fiercely. In captivity, they can live up to 20 years, which is similar to other large cats. Click to see more and buy online from Amazon! There's some good news for cougars, especially compared to other wild felines, which have far more trouble dealing with habitat loss and other factors which threaten populations. Cougars are rated "least concern," which means they don't face immediate threat of extinction. Although exact numbers are always difficult, scientists estimate that about 50,000 cougars live in the wild, and this relatively large population, as well as their wide range and adaptability to a variety of habitats, is part of what gives the mountain lion a good chance at surviving for a long time. However, that doesn't mean it's time to stop worrying. Cougars face a serious threat from hunters, especially in the United States, where some states don't even have laws against hunting them. Farmers sometimes consider them a threat to their animals, and will hunt and kill them to protect their farms. Over in Florida, cougars are critically endangered. This population, called the Florida panther, is the only known surviving population of cougars in the eastern United States, and survival is very challenging when cut off from other breeding populations. If the cougar is going to survive in North America, serious conservation efforts need to be improved, especially in areas like Florida, with such a low population, and Texas, which seems to have no laws regulating cougar hunting at all. Organizations like Big Cat Rescue and the World Wildlife Fund work to protect many wild animals, and with enough support, future generations of kids and adults will be able to enjoy these beautiful creatures, and maybe even see them in the wild. Because you can never get enough cougar pictures! Cougars are an important symbol in Native American mythology, appearing in stories and artwork throughout North and South America. The cougar is a symbol of power, strength, and secrecy, and is still popular even in modern societies, used as a symbol for certain companies even today. Like all wild cats, cougars are popular with kids and adults, fascinating so many people with their mysterious ways and their great hunting ability. If conservation efforts are kept up, cougars will keep fascinating and inspiring people for many years. 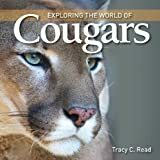 Hopefully you've enjoyed learning all sorts of fun facts for kids about cougars, or mountain lions, or pumas, or whatever you like to call them. Here are some more pictures of mountain lions for everyone to enjoy! Want to learn fun and interesting facts about ocelots for kids? Learn all about ocelots, from habits to habitats to all sorts of other fun facts about this adorable jungle cat. Want to learn fun facts about tigers? Come check out all sorts of interesting tiger facts, pictures, video and more! Looking for fun and interesting facts about jaguars for kids? Learn all about this mysterious jungle cat and what makes it special. Nice article! Cougars are very shy, and it's rare to see them in the wild. They are occasionally spotted, however.